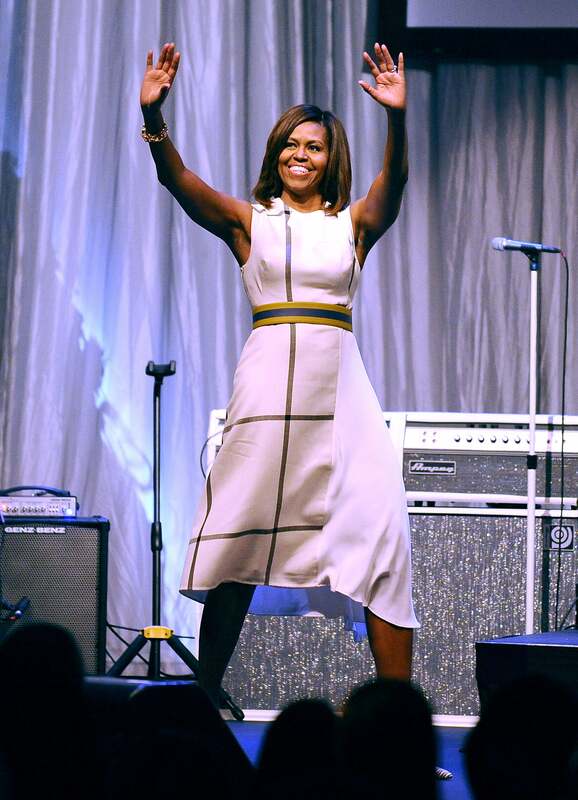 Over the last 8 years, Michelle Obama has become a pillar of First Lady style. Taking chances, changing perceptions about what should be deemed appropriate and becoming one of, if not the most influential First Lady since Jackie Onassis — Mrs. Obama made her mark. 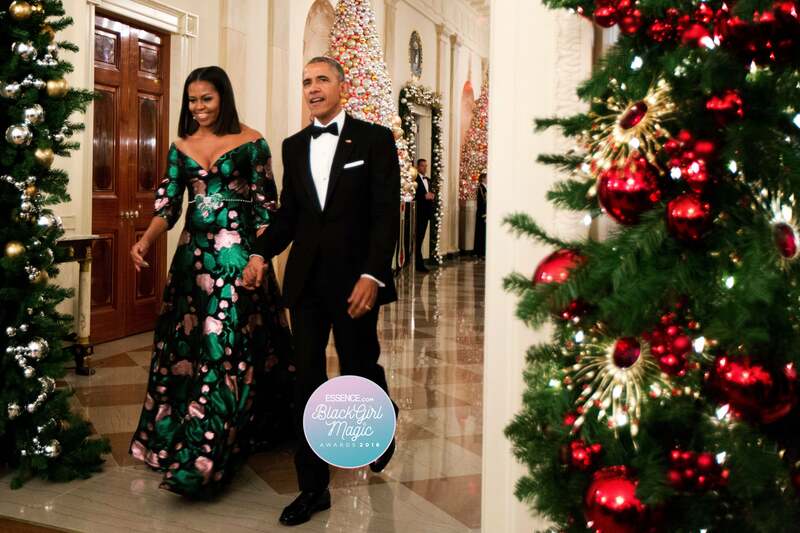 As her time in the White House winds down, we're paying homage to the game-changing fashion moments she's delivered over the years. 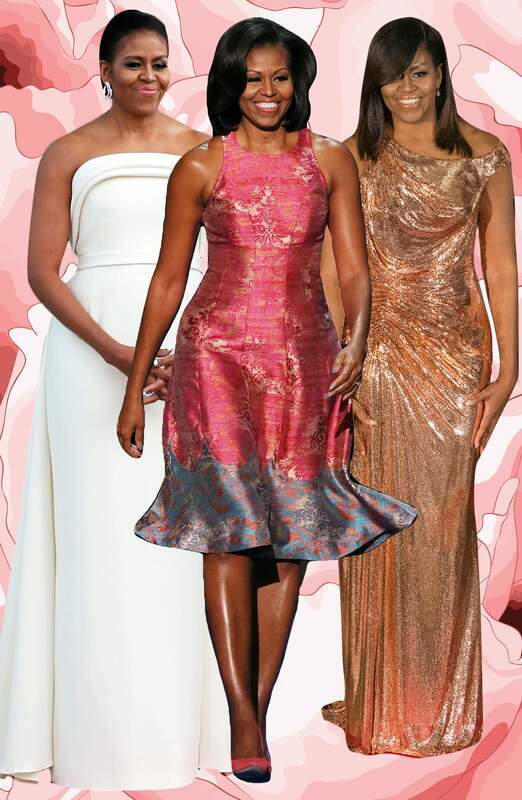 Behold, Michelle Obama's best style moments of all time. In Peter Soronen after a 2009 black-tie dinner at the White House. 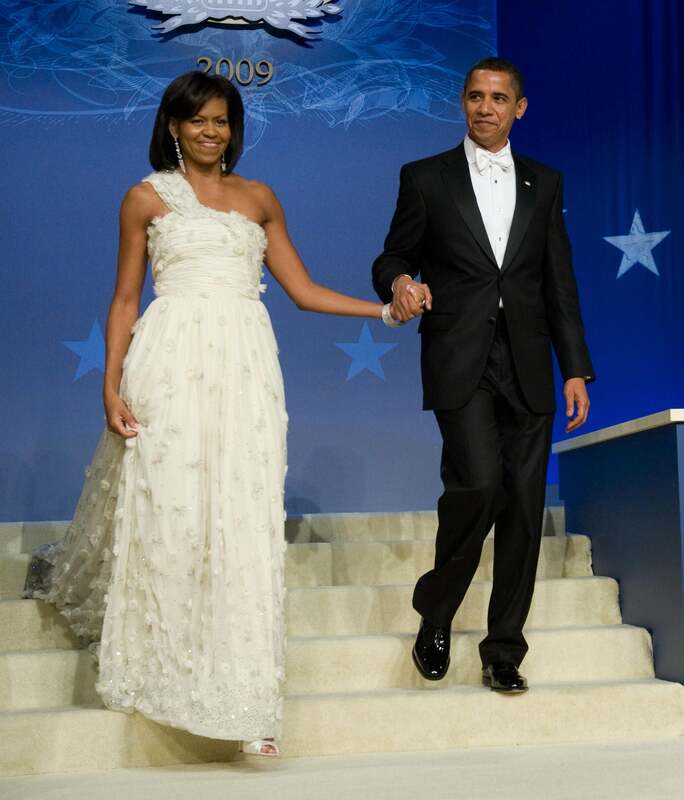 In Jason Wu during the 2009 Neighborhood Inaugural Ball in Washington, DC. 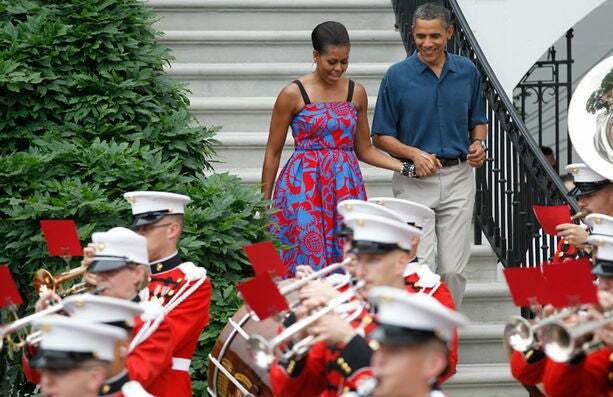 In a vibrant floral dress while attending the 2011 APEC Summit in Hawaii. 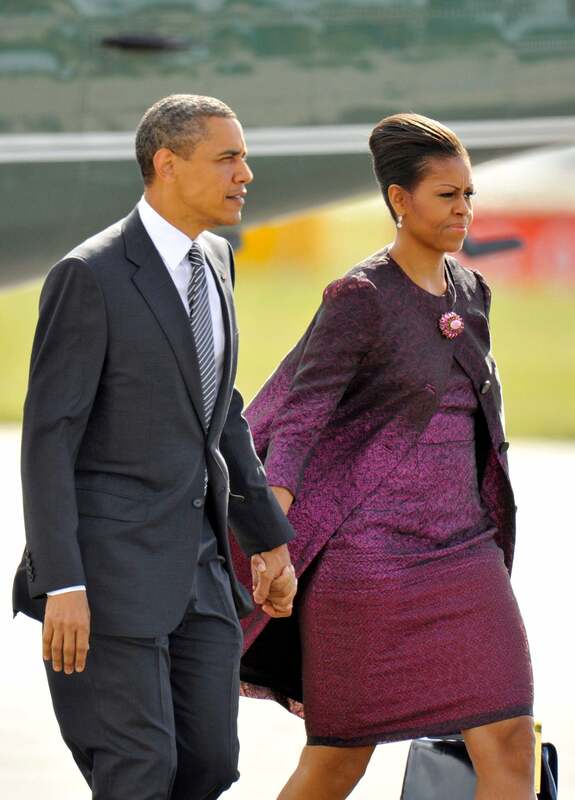 In a purple two-piece suit while leaving the UK for the G8 summit in 2011. 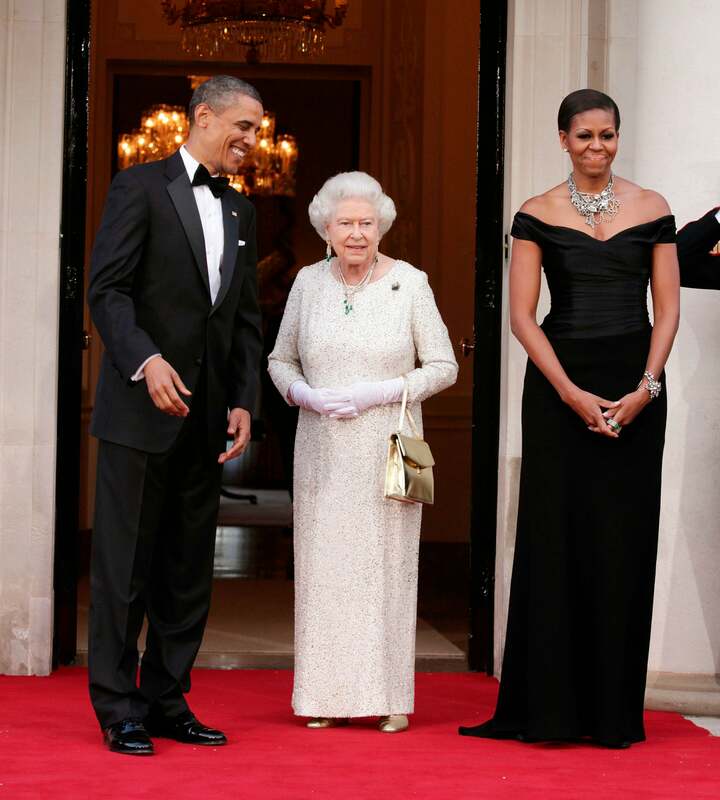 In Ralph Lauren before a 2011 Dinner at Winfield House in London, England. In a Sophie Theallet dress while celebrating Independence Day in 2011. In J. Mendel at the 2012 BET Honors. 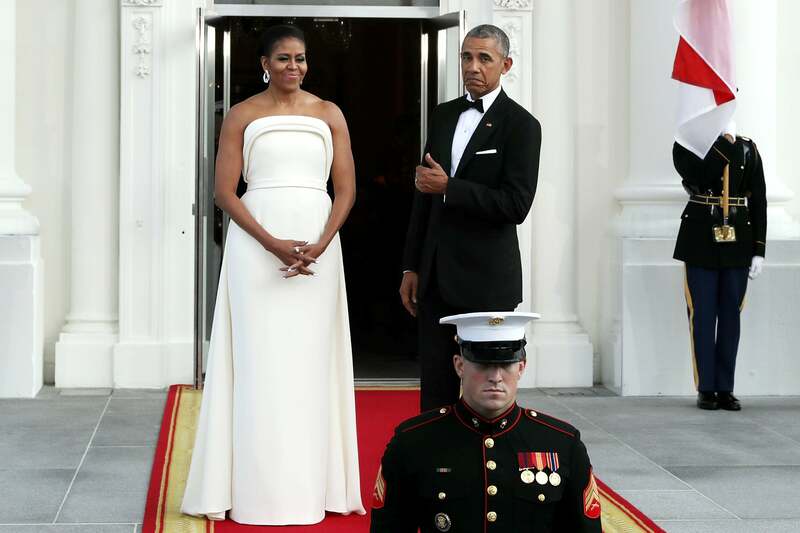 In a Sarah Burton for Alexander Wang gown as President Barack Obama welcomed Chinese President Hu Jintao to the White House in January of 2011. 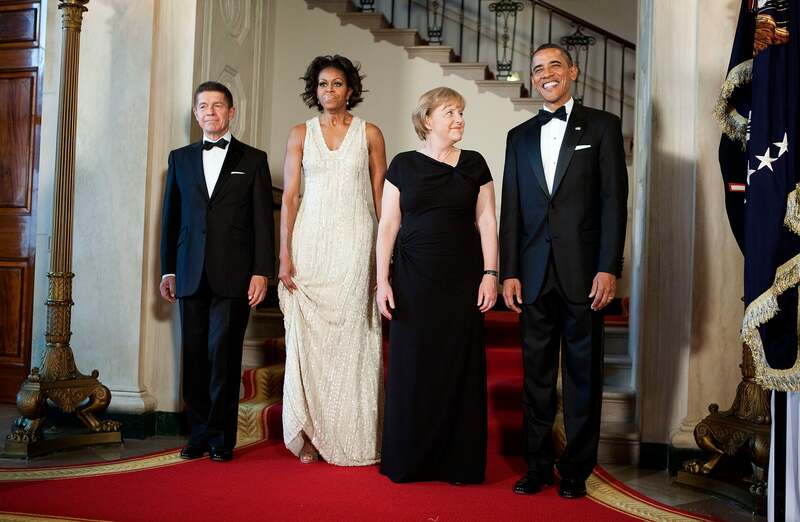 In a silver beaded Naeem Khan dress as she poses alongside President Barack Obama, Angela Merkel, chancellor of Germany, and Joachim Sauer, Merkel's husband at the 2011 state dinner. In Marchesa at the 2013 Kennedy Honors Gala. 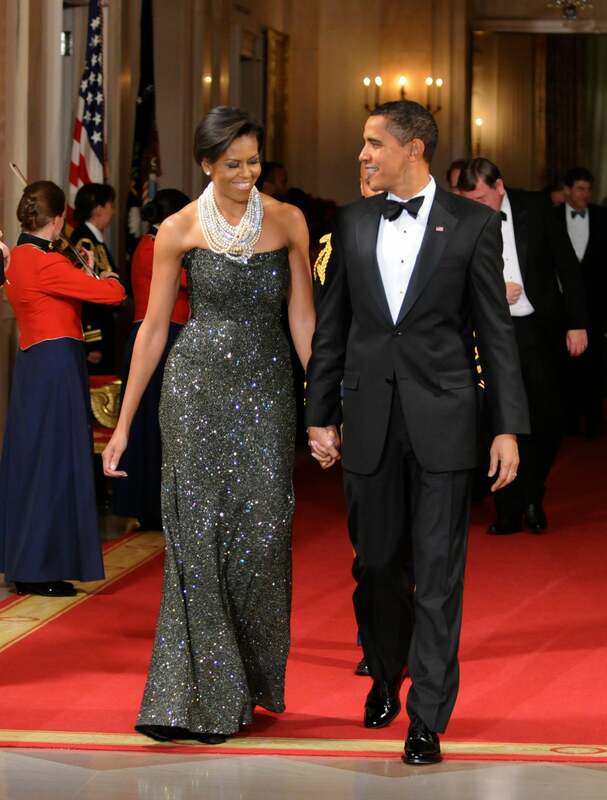 In Naeem Khan dress while attending the 2012 White House Correspondents Dinner. In a Jones New York dress while speaking at Florida's Broward College in 2012. 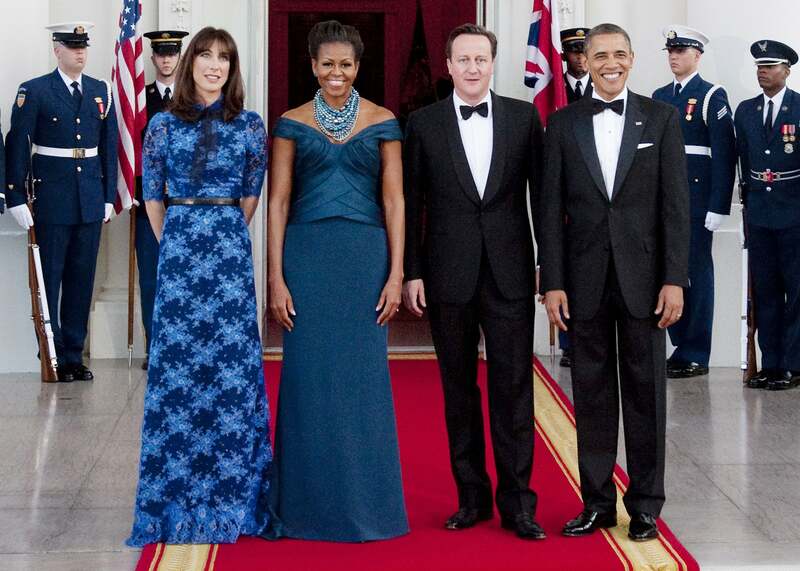 In a jewel-toned Marchesa gown while welcoming British Prime Minister David Cameron and his wife, Samantha Cameron for the State dinner in March of 2012. 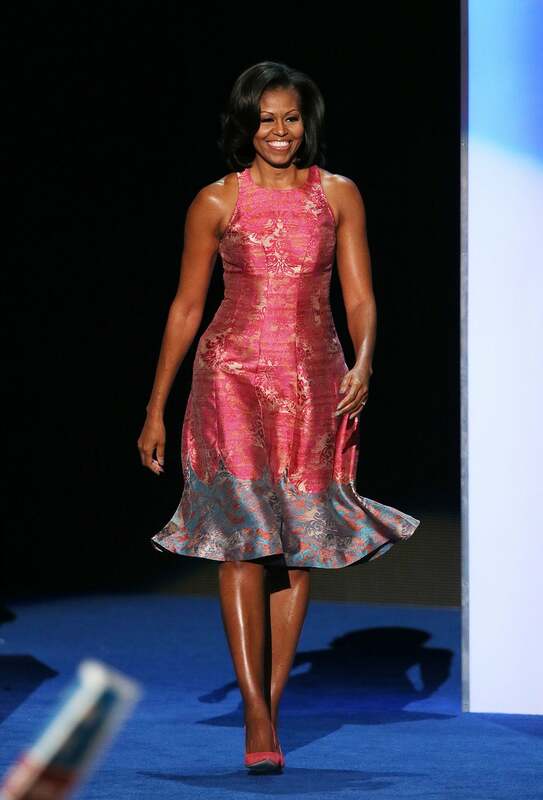 In Tracy Reese during day one of the 2012 Democratic National Convention. 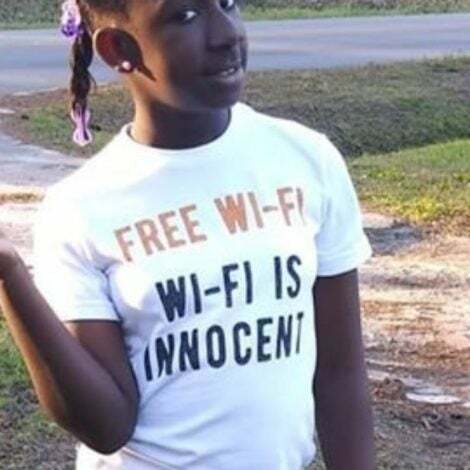 In Tracy Reese while commemorating the 50th anniversary of the march on Washington in 2013. 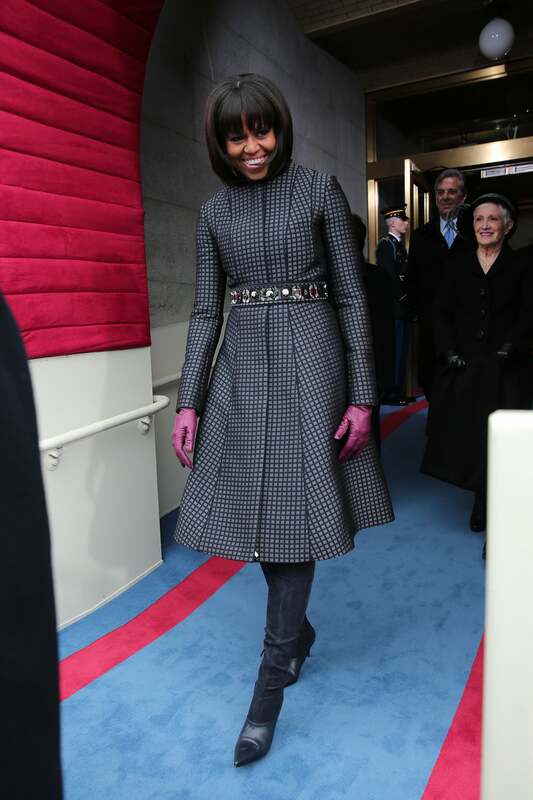 In Thome Brown during the presidential inauguration in 2013. In Naeem Khan while presenting the 2013 Oscar for Best Picture. 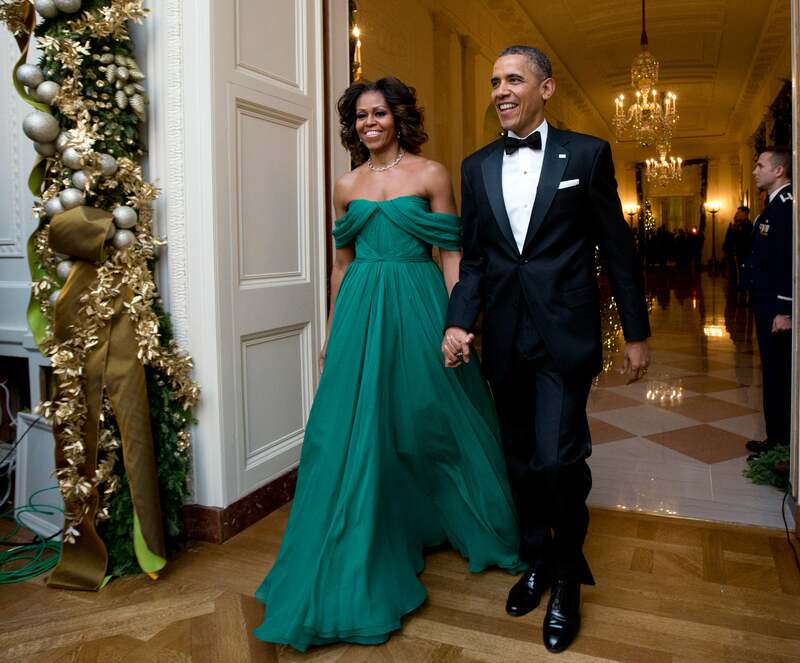 In Jason Wu during the 2013 Inaugural Ball. 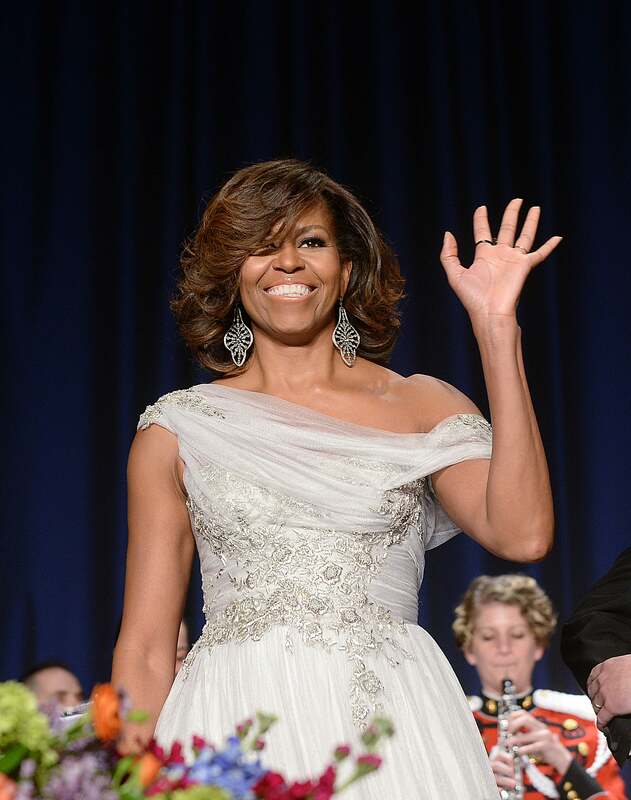 In Marchesa while attending the annual White House Correspondent's Association Gala in 2014. 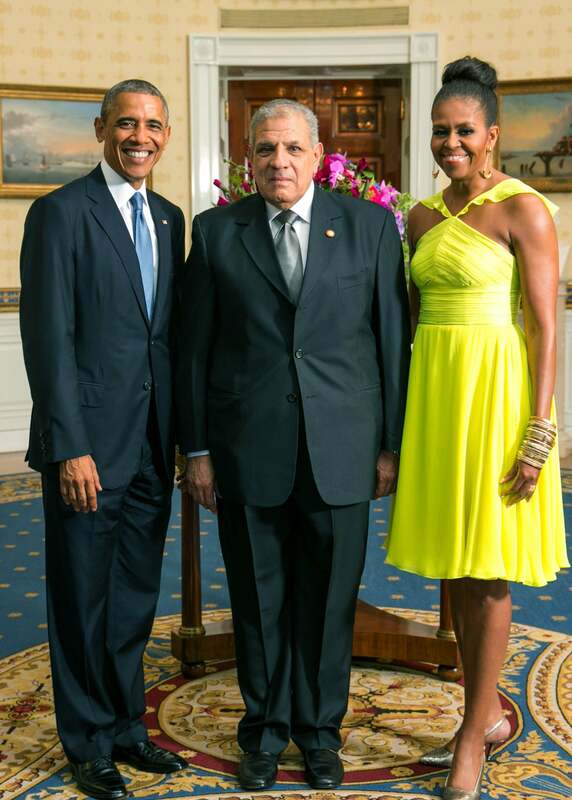 In Laura Smalls while celebrating Cinco de Mayo at the White House in 2014. 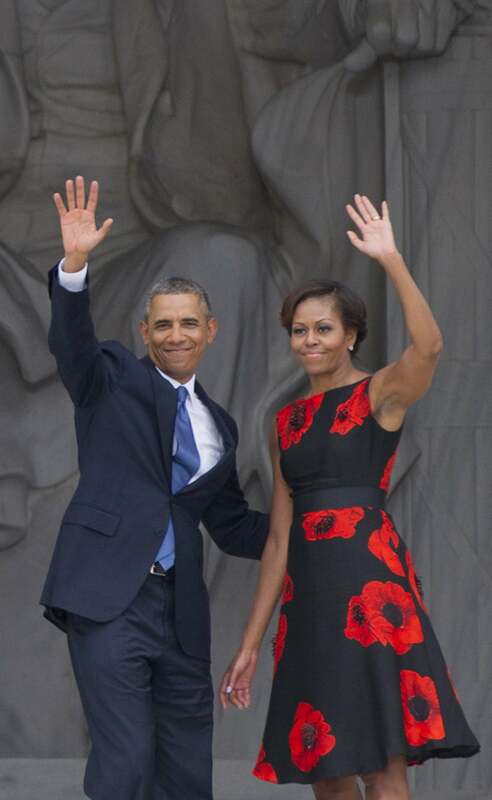 In Prabal Gurung as she poses alongside President Barack Obama following the U.S.-Africa Business Forum speaking in 2014. 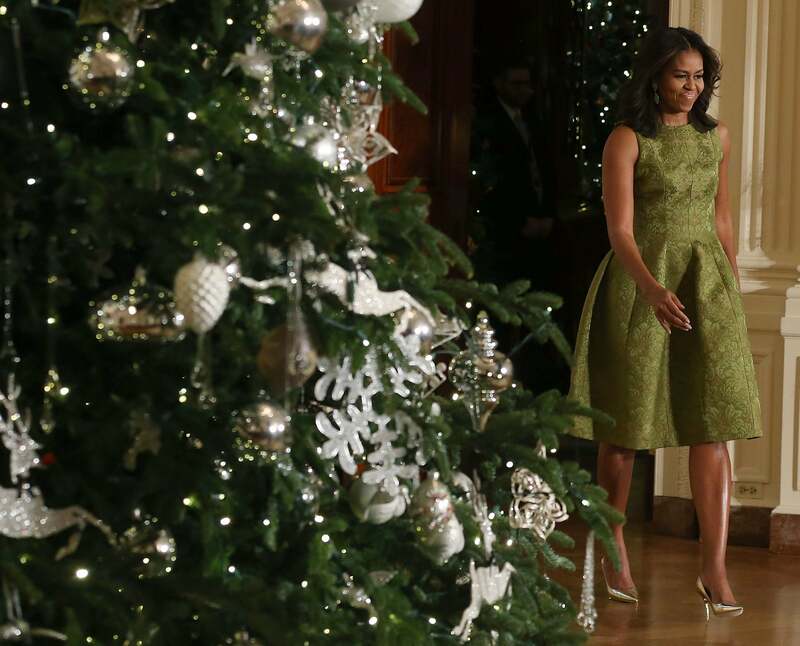 In Michael Kors Collection during a preview of the 2015 holiday decor at the White House in 2015. In a printed white dress while attending the The Grammy Museum's Jane Ortner Education Award luncheon in 2014. In a citrine Kenzo dress as she lands at Tokyo's Haneda International Airport in 2015. 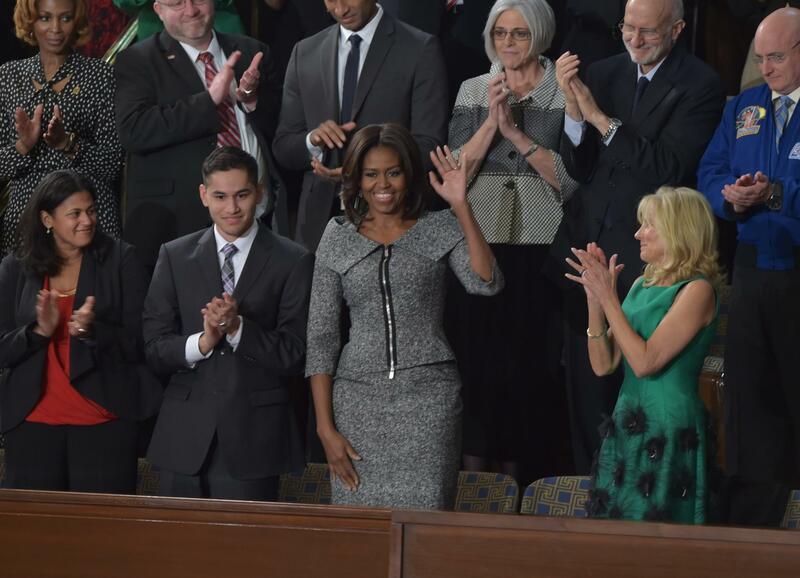 In Michael Kors for the 2015 State of the Union address by husband US President Barack Obama at the US Capitol in Washington. 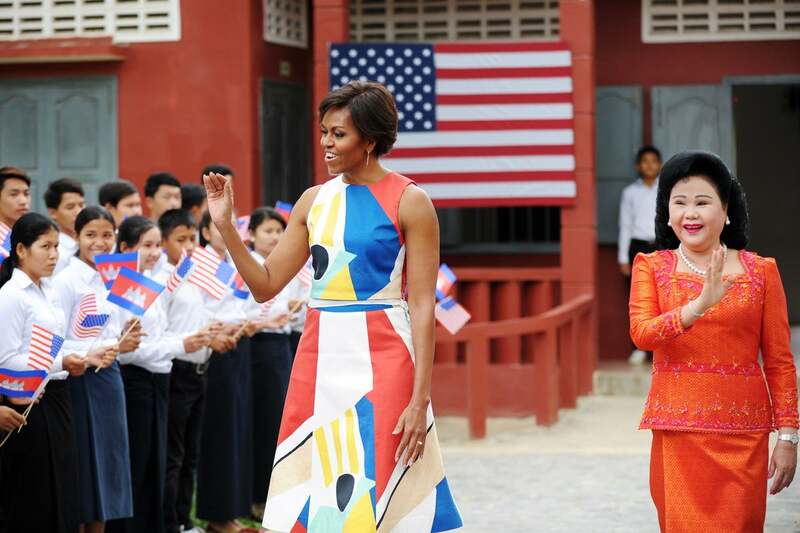 In Alice + Olivia during a visit to a school in Siem Reap province in 2015. 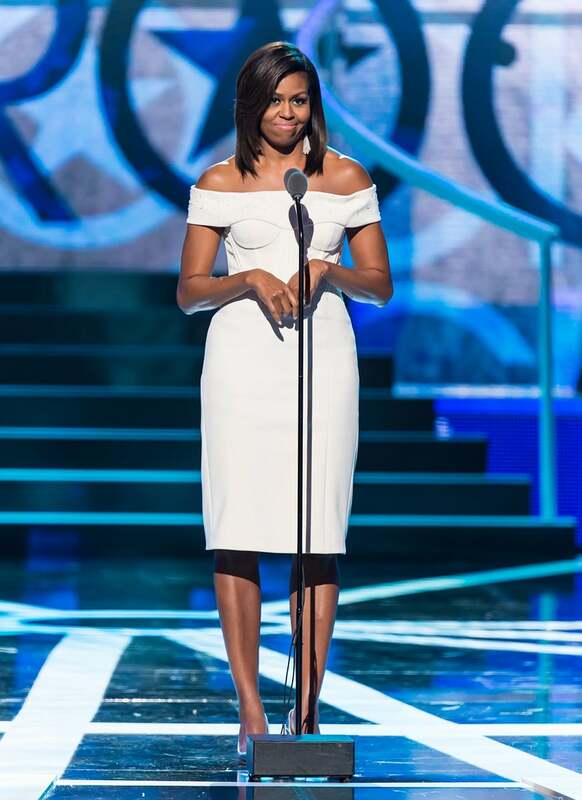 In Zac Posen while speaking onstage during 2015 'Black Girls Rock!' 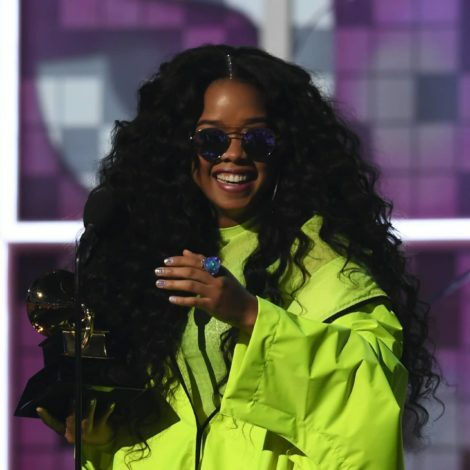 BET Special at NJ Performing Arts Center in Newark, New Jersey. 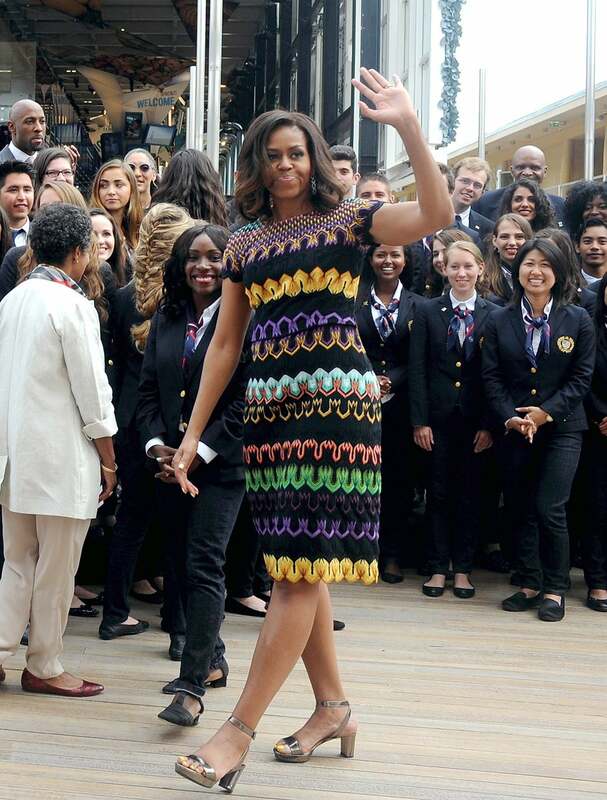 In Missoni as she arrives at the United States Pavilion at the Milan Expo 2015 in Milan, Italy. 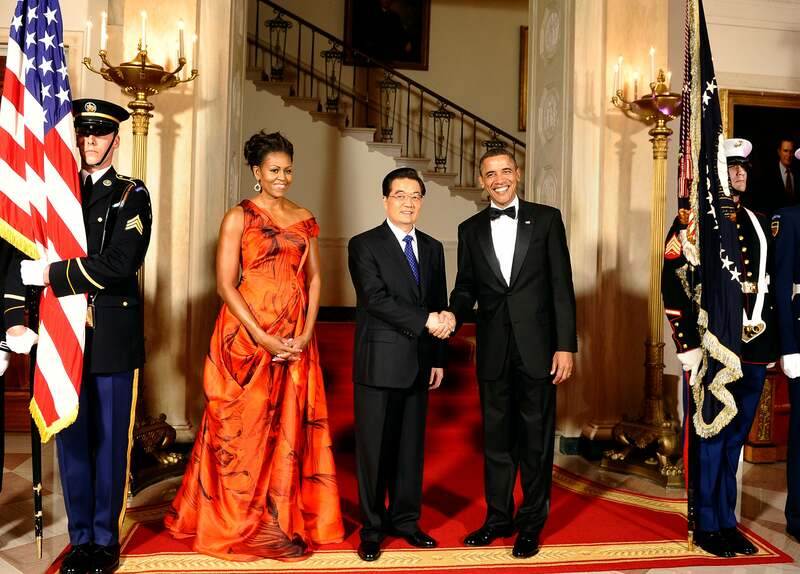 In a silk mermaid Vera Wang gown alongside President Barack Obama while awaiting the arrival of Chinese President Xi Jinping and his wife Madame Peng Liyuan, at a 2015 state dinner. 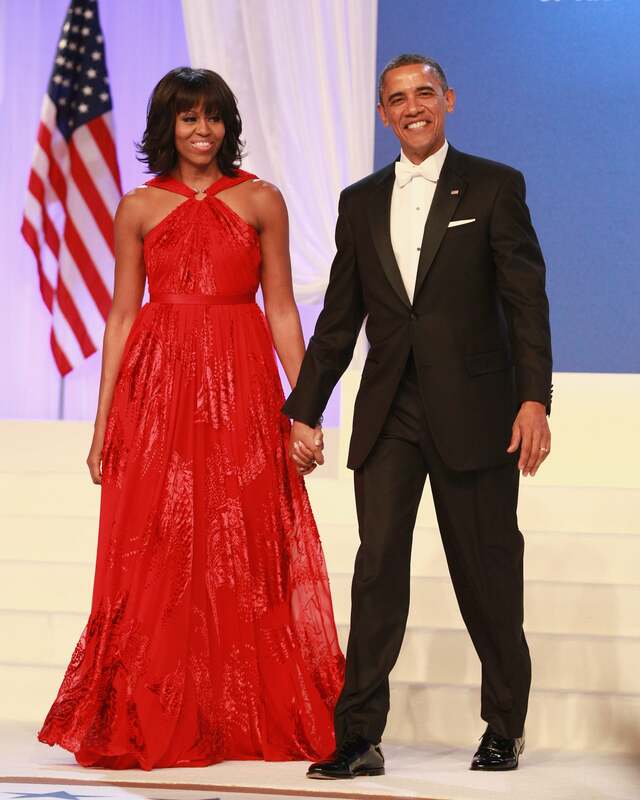 In Zac Posen while attending the 2015 White House Correspondent's Association Gala. 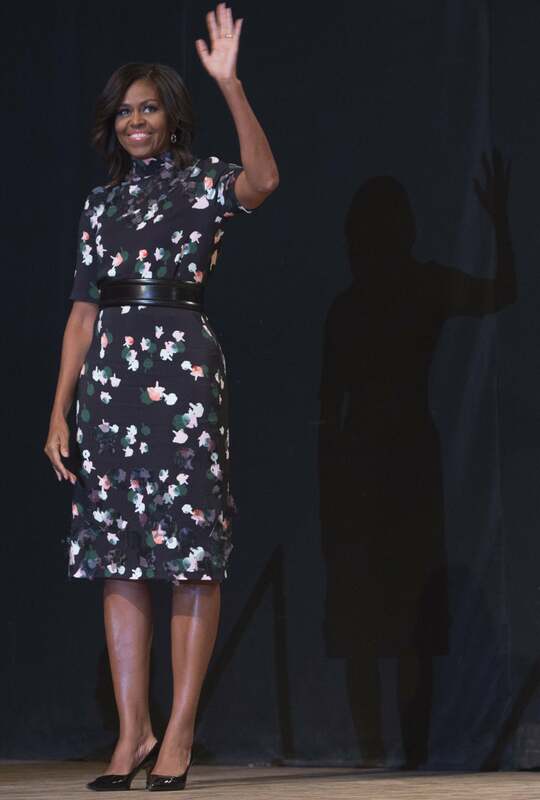 In a printed floral dress while attending a speech by US President Barack Obama on US-India relations during a 2015 townhall event in New Delhi. 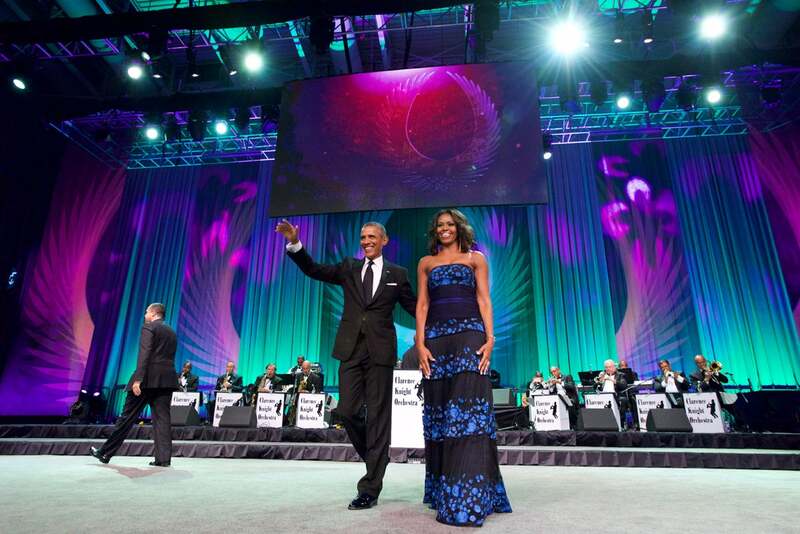 In Tadashi Shoji while attending the Phoenix Awards Dinner for the 45th Annual Legislative Black Caucus Foundation Conference in 2016. 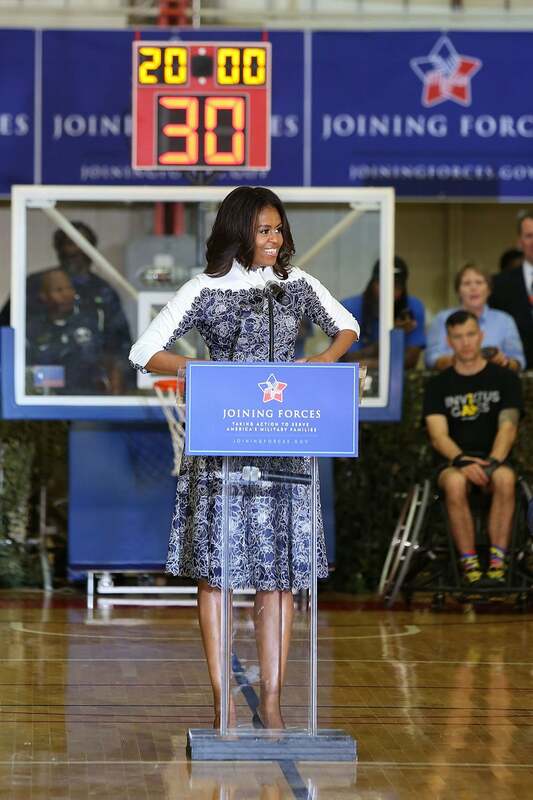 In Tadashi Shoji as she speaks at the Joining Forces Invictus Games Event at Wells Field House in 2016. 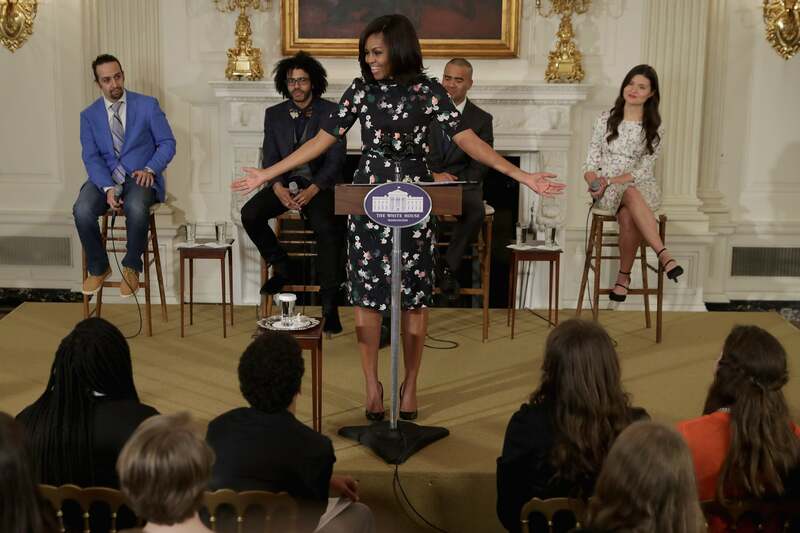 In black and white eyelet dress while hosting National Student Poets Program With Hip Hop Artist Q-Tip in 2016. 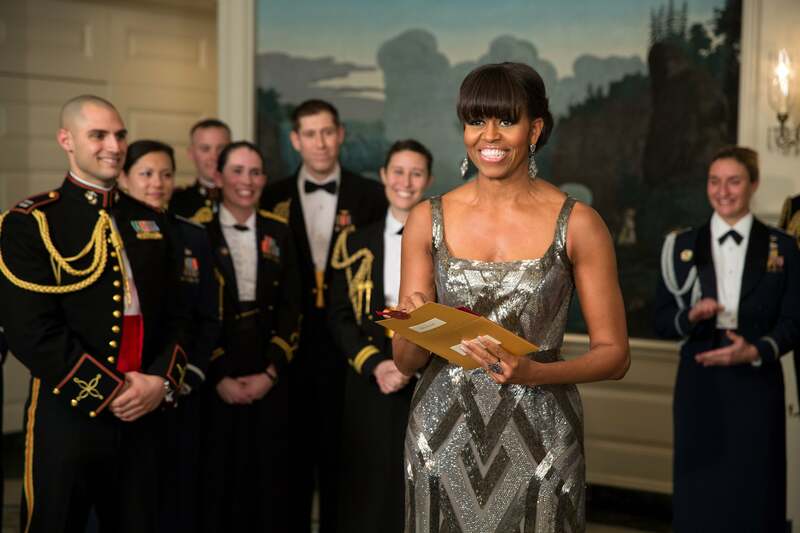 In Brandon Maxwell while hosting State Dinner For Singapore in 2016. 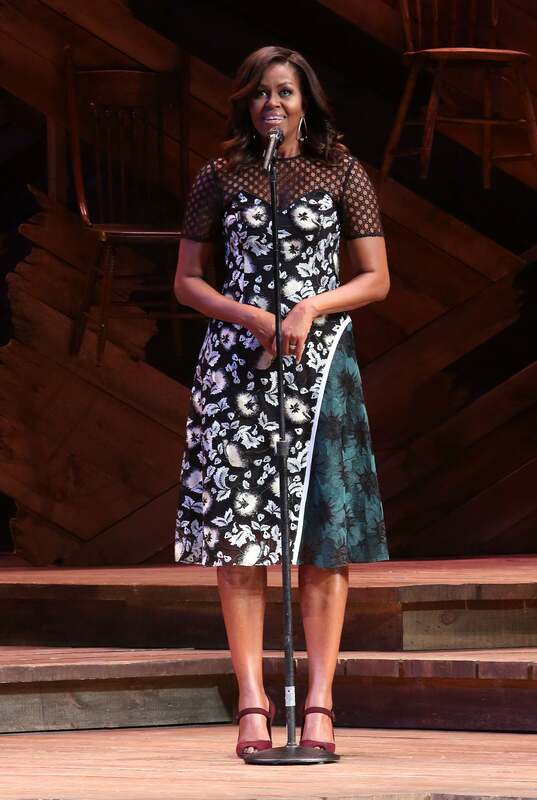 In a floral a-line dress while hosting the 'Broadway Shine A Light On Girls' Global Education' at The Bernard B Jacobs Theater in 2016. 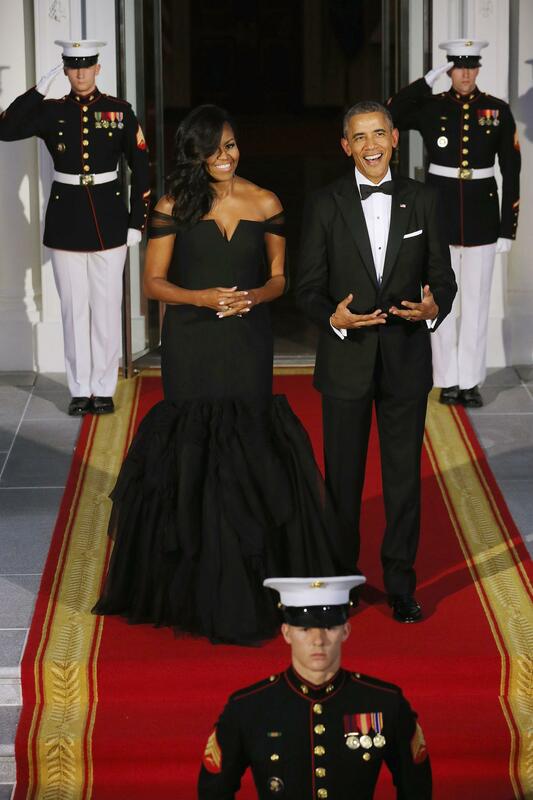 In Atelier Versace while attending the 2016 State Dinner. 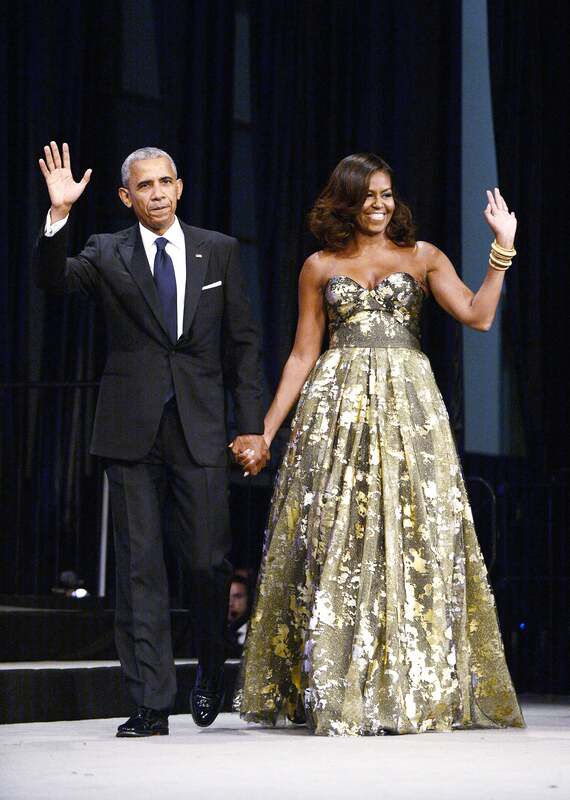 In Naeem Khan while addressing the Congressional Black Caucus Foundation's 46th Annual Legislative Conference Phoenix Awards Dinner in 2016. 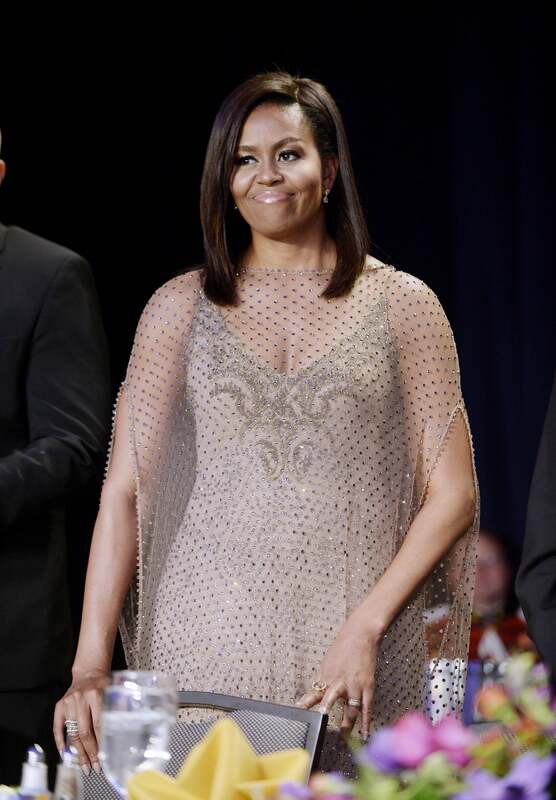 In Givenchy Haute Couture while attending the 2016 White House Correspondents' Association dinner. In Tanya Taylor while welcoming the Broadway cast of HAMILTON in 2016. 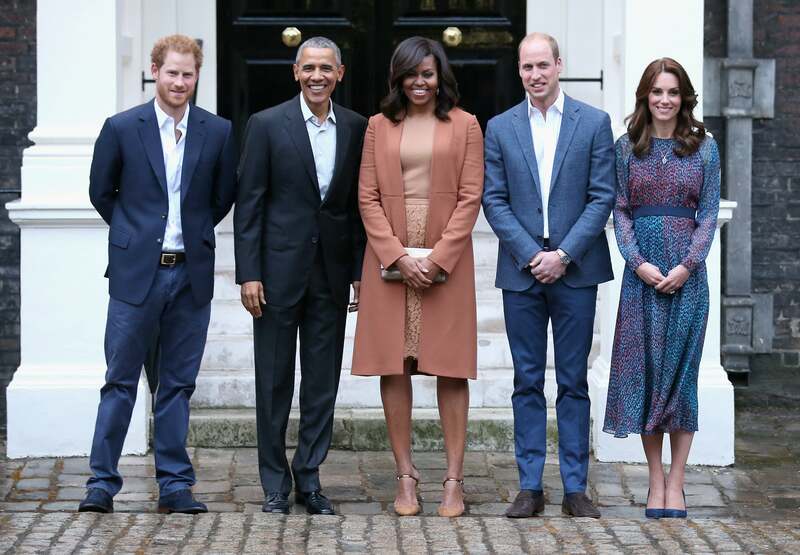 In a monochrome look paired with Jimmy Choo pumps while posing alongside US President Barack Obama, Prince Harry, Prince William, Duke of Cambridge and Catherine, Duchess of Cambridge at Kensington Palace in London, England in 2016. 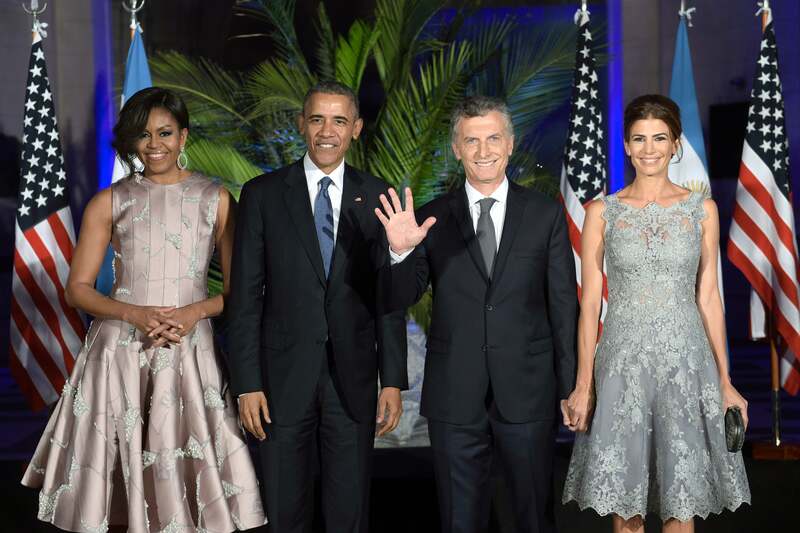 In a metallic gown with shimmery embroidery while attending dinner at the Kirchner Cultural Centre Buenos Aires in 2016. 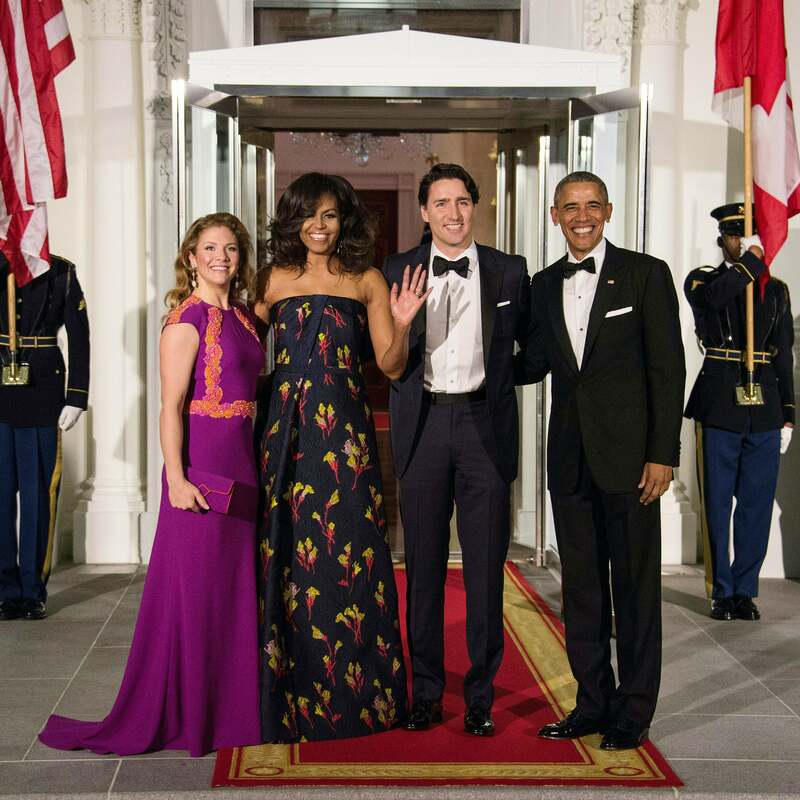 In a Jason Wu gown as she and President Obama welcome the Canadian Prime Minister Justin Trudeau and his wife Sophie in 2016. 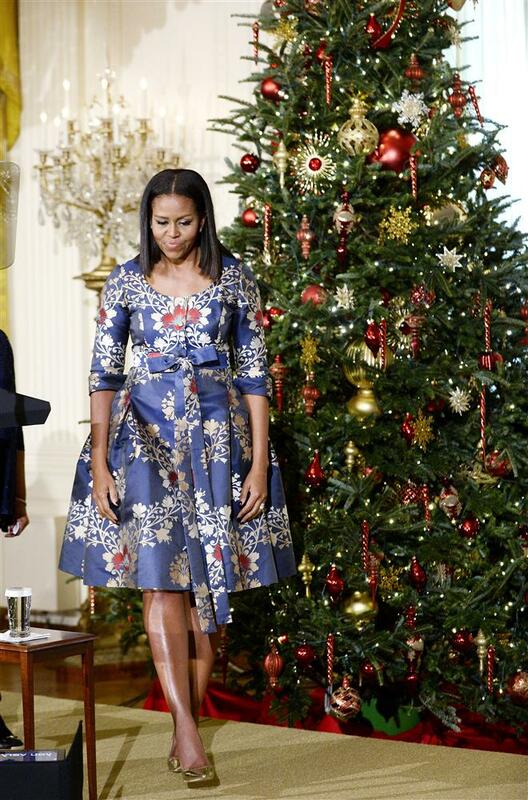 In a floral a-line dress while unveiling the 2016 holiday decorations in the White House. In Gucci while attending the 2016 Kennedy Center Honors at the Kennedy Center in Washington, DC. 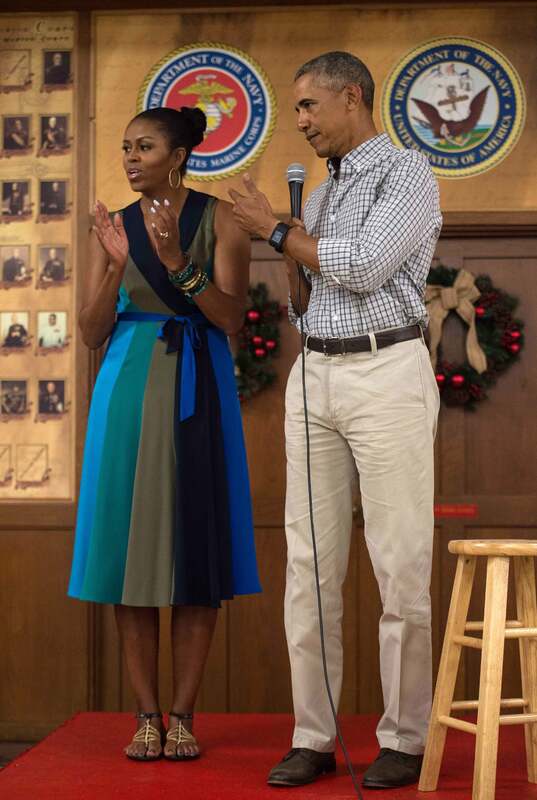 In a multi-colored wrap dress as she addresses troops with President Barack Obama at Marine Corps Base Hawaii in Kailua. 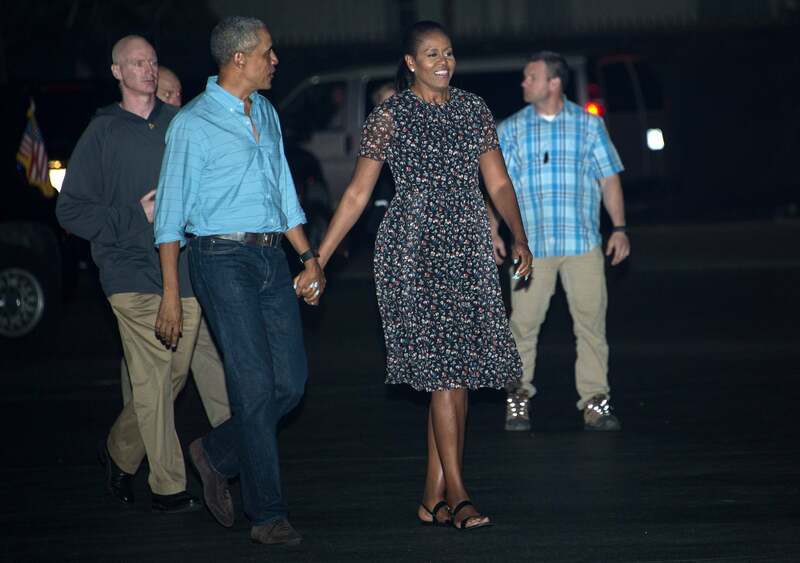 In a sheer floral dress while walking to board Air Force One at Joint Base Pearl Harbor-Hickam in Honolulu, Hawaii. 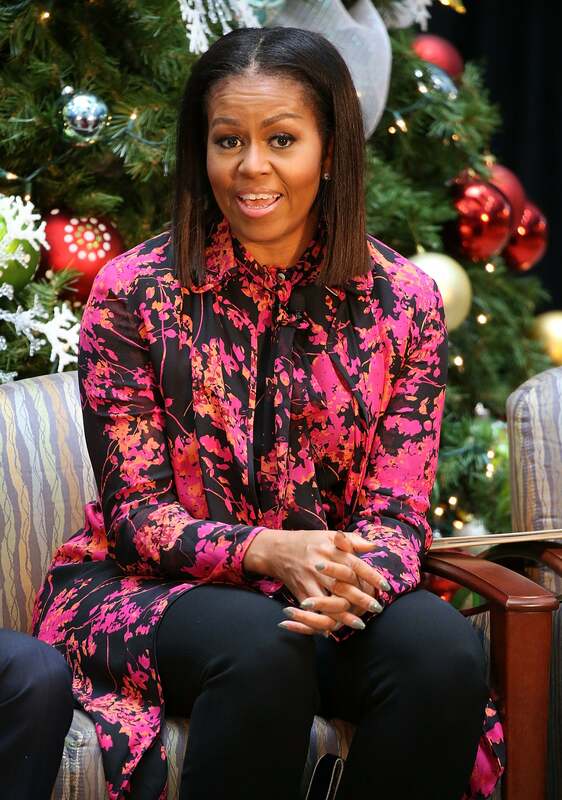 In a floral top and cardigan with high waist trousers at Children's Health System in Washington, DC. 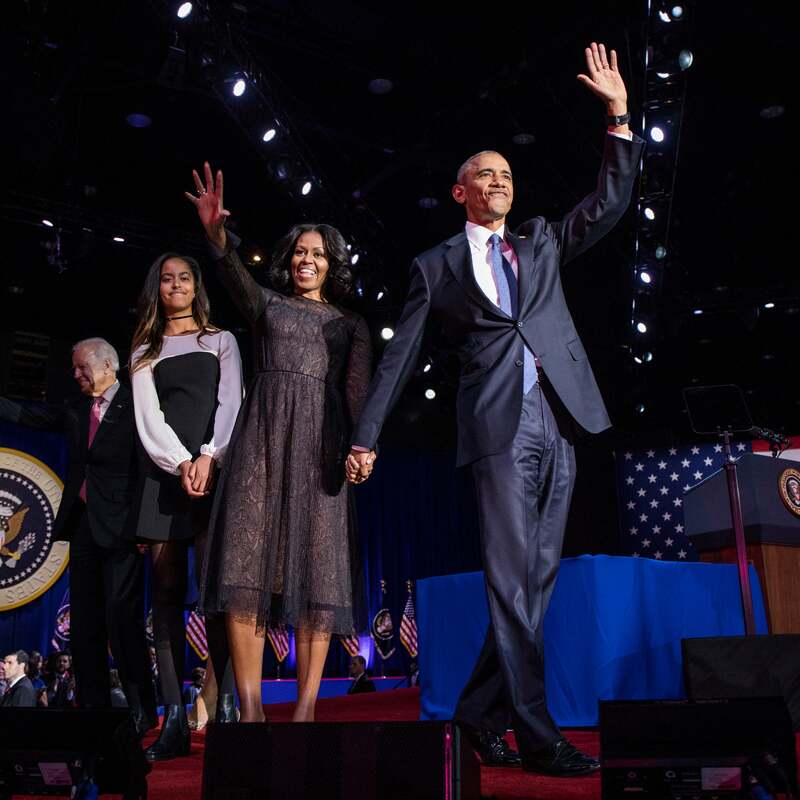 In a navy blue lace dress after President Obama's farewell address at McCormick Place in Chicago. 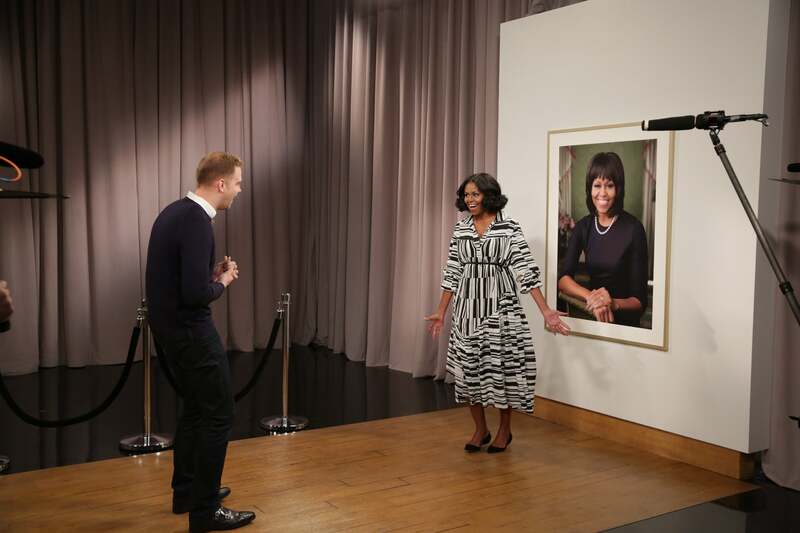 In a graphic black and white dress while surprising guests during the "Thank You First Lady Michelle Obama" segment on The Tonight Show Starring Jimmy Fallon.. In a black peplum dress with zipper details on The Tonight Show Starring Jimmy Fallon.